Your legs and offensive linemen have a lot in common. They aren’t flashy, people rarely talk about them and they’ll never receive enough credit despite the important job they do. Though many people think ripped abs or chiseled pecs are more impressive than a powerful set of legs, don’t be fooled: Training your legs can help you improve the appearance of your entire body, burn more fat and boost your cardiovascular health. A great lower body plan isn’t built around a leg curls and calf raises. In fact, you’re probably better off avoiding most machines altogether. You should also pay more attention to muscles other than your quads, and try standing on one leg every once in a while. Use this guide to working the muscles you too often ignore and you’ll have the complete playbook for building a winning body. Here are three key components to your best leg day ever. Ask a guy what he thinks of of when he pictures a strong set of legs and he’ll probably mention the quads — those powerful pistons of the thighs. But while the front-facing quads are important, they tend to get too much focus in many lower body training routines. The muscles on the inside (adductors) and back of your legs (hamstrings and glutes) need attention, too. Balance quad-dominant movements with exercises that hit your other leg muscles, and it’ll pay big dividends, particularly with injury prevention. You’ve probably seen guys at the gym throwing big plates onto a leg extension machine, then grunting as they straighten their legs. It's a waste of time. While moves like leg extensions or hamstring curls may feel like they’re working your legs, they actually limit how fast you can make strength gains. Isolation exercises restrict the total number of muscles involved in a movement and also decrease how much weight you can lift at once, because fewer muscles are available to share the load. Exercises like deadlifts and squats, on the other hand, which incorporate more muscles and allow you to use heavier weights, lead to more muscle stimulation, faster. That means accelerated muscle gains and fat loss — all while spending less total time training. Curls. Shoulder presses. Even squats. What to all of these exercises have in common? If you’re like the average gym rat, you’re probably standing on two legs when you do them. But altering the movement so that you’re standing on only one leg can make all of your muscles work harder. Going monopod also helps train your core, eliminates sneaky weaknesses and provides huge benefits to your functional strength and stability. After all, in most day-to-day activities — not including sitting at your desk — and sports, you spend most of the time standing on one leg or the other, but not both. So it’s critical that your train this way. You might have to use lower weights, but don’t worry. The benefits you’ll reap in increased strength and improved balance will far outweigh the embarrassment you might feel from lifting a smaller dumbbell than usual. The following plan uses two leg-specific training sessions per week and has an appropriate balance of exercises that work the back and front-side of your legs. It also incorporates lots of single-leg work. 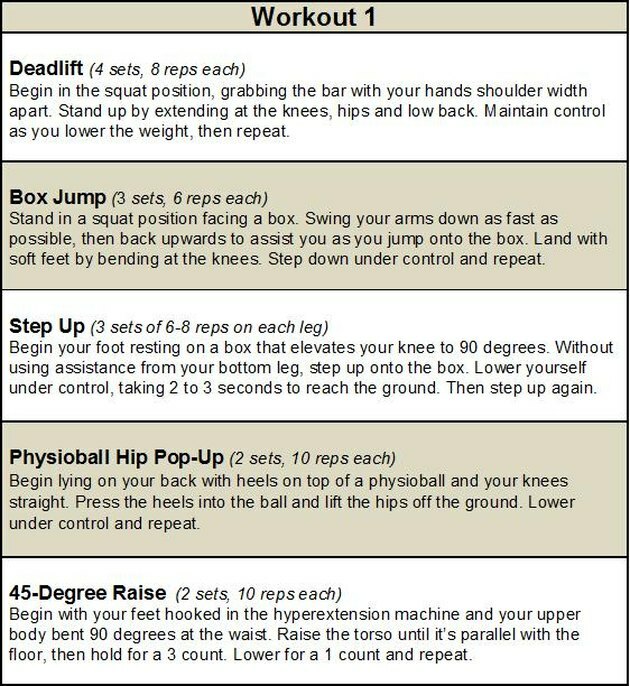 Perform these workouts for four weeks (do each workout once each week), making sure you rest at least three for four days between each.